Little Painted Nails: Who Doesn't Love the First Day of School? Avery, That's Who. Who Doesn't Love the First Day of School? Avery, That's Who. To a parent, the beginning of the school year can unveil a plethora of feelings. To some, it's the sadness that little Johnny is growing up, to others, the joy of afternoon freedom to sneak in an extra round of golf here and there. This year, for me it signified the beginning of a countdown; 365 more days until I am done paying for day care. Some people saw it as a sad time, but to me it was bliss. I felt the same about paying for formula and diapers. I dropped off my eldest two daughters at school and felt happy. 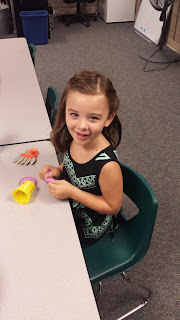 My eldest is smart and funny and already has a nice group of friends in her class this year and my middle daughter, Macy, has always been outgoing and judging by the conversations she started in line waiting to get into the classroom day one, I knew she would be just fine. My youngest will start preschool in a couple of days but has already attended the school and will do great. I dropped my girls off at school and got back in my car. I felt something unusual for the first day of school, it was strange, I felt comfortable. My wife and I drove to the office and talked about the first day. We laughed about Macy introducing herself to the other kids in class and were happy that Avery had some of her best friends in her class. Had I known what was coming I would have bottled the emotion. That night, the girls were bouncing off of the walls when they got home. They played in the yard and both promised that they would talk about school over dinner. At dinner, Macy regaled us with stories of the naughty boy who got sent to the office and how much she loved her new teacher. Avery, on the other hand, was more elusive. She said that she liked recess, and it was nice seeing her friend Maddy, but that was it. Red flags went up but I tried not to read too much into it. Adrienne and I discussed it a touch before bed. The next morning was a different story, however. Upon waking her up she declared that she was sick and couldn't go to school. The red flags were a deeper shade. She then told me that she didn't want to go back to school at all...ever. The red flags were now glowing. I'd like to personally thank the media for putting the litany of ideas in my head of what could be wrong. Was she being bullied? How about a grown up? Dyslexia? ADD? What could have this little girl so insistent that school was an awful place? My stomach was in knots as I tried to unpack my little girls mind and get to the bottom of what was bothering her. The conversation was a clunky ballet of my questions and her confused answers. "Does anyone in school ever pick on anyone else?" I'd ask, "No, the kids are really nice at my school." She'd volley. This dance went on until she was nearly late for school. I felt frustrated and I had a growing anxiety towards sending my daughter off to school without uncovering the source of her discomfort. Finally, I just asked, "What is it sweetheart? Why don't you want to go to school?" "I don't like math. Science is good and I love reading but I hate math." she answered with adult sincerity. That's it. Math. No bullies, no learning disorders, just math. The takeaway? That's not as easy. First of all, remember that your daddy panics. For whatever reason, I am wired to think of the absolute worst outcome and then work my way backwards to the most likely. I you have a choice, don't be that way. Truthfully, it's okay to hate math, you still have to do it but feel free to hate it. You can hate math, or science, or PE or music. It's fine. But don't let your hating something keep you from learning something fun or important. It's all about context. Science is a lot more fun when doing experiments and reading tends to be more fun when you pick the book. For math, consider that all astronauts, doctors, and chefs use math. Thinking of that may help, it may not, I already knew that and I still hate math.